addSets is a Mel script designed for better management of quick selection sets. It allows the user to append, truncate, and delete sets with much greater control. It is ideal for intersecting multiple quick select sets. Only sets with the suffix _SET will be considered. Deletes all history, optimizes the scene, and removes any residual cluster sets. ReduceMaterial is used to remove multiple materials created when importing scenes with identical materials into each other. There are two requirements that must be met. Identical materials in both scenes must be named EXACTLY the same (case sensitive). Secondly, when you import, go to the import options, and under Name Clash Options: "Resolve CLASHING NODES with THE STRING IMP". Do not include quotation marks. Also be sure to uncheck Use Namespaces in the import options. Great for applying vertex coloring. This script grows the selection, while deselecting the original selection. This allows for easier blending of colors. Detach and Clone faces of an object in an extremely efficient and safe manner. Renames shading networks based on diffuse texture name. times they are easier to work with without the alpha data. Quickly mirror an object using the pivot point as the mirror plane. An extremely rudimentary, but very handy script. TT_PolyCube creates a cube with the pivot at its base instead of centered to the object. An extremely rudimentary, but very handy script. PolyCylinder_TC creates a cylinder with the pivot at its base instead of centered to the object. gets in the way of seeing texture seams. TextMat automates creating materials simply by browsing for an image file. already exists for an image file within the chosen directory, a new Material will NOT be created. UVStraight attempts to average rows or columns of UV's. In the UVEditor, start by selecting several vertically OR horizontally oriented parallel edges (not both). Run UVStraight from the command line. This will bring up the interface. each loop, average them to make a perfectly straight vertical alignment of your uvs. If your initial edges are lying horizontally, use the -U- button to average auto selected edgeloops into perfect horizontal alignment per loop. By default, UVStraight will automatically convert your initial selection into edge loops, and will also contain those loops to within the UVShell. You can disable both of these options as needed with the provided checkboxes. 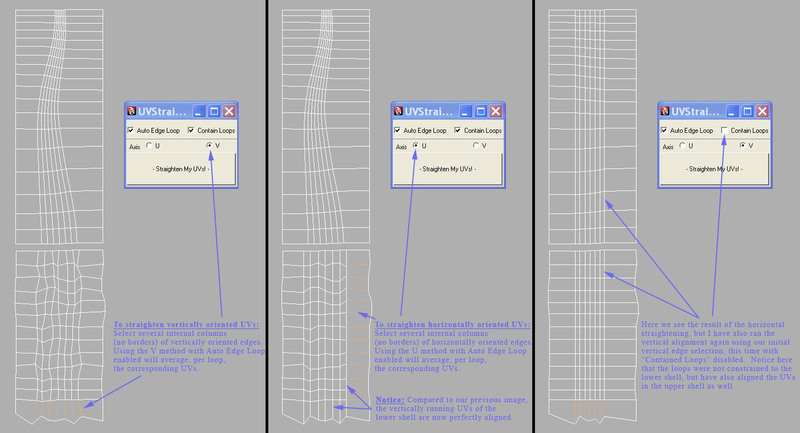 CAVEAT: Auto Edge Loop will NOT work well on texture borders, as Maya is unable to return loops from border selections. In general, I only recommend this script only for internal edges, not shell borders. VertStraight attempts to average rows or columns of vertices. If you wish to average edges to the Z axis, start by selecting several edges roughly perpendicular to Z. Run VertStraight, choose the Z method, and press "Straighten my Verts". If you wish to average edges to the X axis, start by selecting several edges roughly perpendicular to X. Run VertStraight, choose the X method, and press "Straighten my Verts". By default, VertStraight will make EdgeLoops from your selection, so you only need to select one edge per row or column you wish to straighten. You can disable loop and shell options with the provided checkboxes. Attach multiple objects together while maintaining the name, translation, rotation, pivot, and hierarchy of the first object. Collapse vertices to a single target vertex. Merge vertices to a set of target vertices. Copy pivot from one object to another. Select the materials assigned to selected faces. Move object pivots to the origin. Copy pivot location from parent to children. Replace multiple objects in your scene with a master object. Select all other faces on an object with the same material assignment as the selected faces. Selects hard edges on your currently selected object. Hardens UV shell border edges. Restores translation data to frozen objects. An interface for numerically scaling, shifting, and rotating UVs. It also contains a number of maya's most common mapping functions. Easily create lightmap UVs for single and multiple objects. This tool will flip any reversed UVs on your object. Set the active UV set to the same set on multiple objects at once. Align rotated UV shells to the U and V axis. "Select-by-material" for multiple materials at the same time. Add random rotation and scale to multiple objects. Move selected objects back to the origin. Renames the default UV set to map1, and removes extraneous UV sets. Film, Automotive, and Industrial Design industries for almost two decades. TTools© improves iteration and removes common bottlenecks in content authoring. Maya™ is a Trademark of Autodesk©. or inherit assumed functionality of Maya™. Automatically unwrap object(s) using smoothing (specifically hard edges) to determine UV texture borders. *Fixed in TTools version 5.0.9.0. No longer requires Bonus Tools! Derive names of children from their parent. Add numerical and alphabetic extensions.